Floods more frequently than 1 in 20 years. Floods between 1 in 20 years and 1 in 50 years. Floods between 1 in 50 years and 1 in 75 years. Floods between 1 in 75 years and 1 in 100 years. Floods between 1 in 100 years and 1 in 200 years. Floods between 1 in 200 years and 1 in 500 years. Floods between 1 in 500 years and 1 in 1000 years. Floods less frequently than 1 in 1000 years. 1. The initial map shown displays the Flood Map for Llandudno. Click on 'View Flood Map for Pensarn to Kinmel Bay' to see the Flood Map for this area or enter a postcode and press the 'Go' button. 2. Use the pan and zoom controls in the top left hand corner of the map window to navigate around the map. 3. Click on any point in the area shaded blue to see its flood probability information for different flood depths (clicking on an area outside the blue shading will reveal an empty information table). Please note, if you are using Internet Explorer version 11 or later you may need to enable the compatibility mode setting for the map to function correctly. If you do not see the information table, please check that you have this setting enabled. i) The probability of the area flooding to any depth. For example, the area may flood more frequently than 1 in 20 years. ii) The probability of the area flooding to a depth of 45cm or more. iii) The probability of the area flooding to a depth of 60cm or more. iv) The probability of the area flooding to a depth of at least 1m. 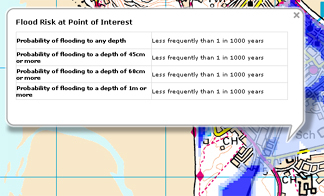 Please see the 'Introduction to Conwy Tidal Flood Risk Study' page for information on how these values relate to TAN 15. These flood maps can be used to produce Flood Consequence Assessments (FCAs). It is incumbent upon the applicant to produce an FCA when seeking planning consent. All developers should contact Environment Agency Wales prior to the commencement of an FCA (see 'Useful Links and Contacts'). Climate change scenarios should also be used to support planning applications. The Conwy County Borough Council Flood Maps are provided free of charge. Whilst all reasonable effort has been made to ensure that they are accurate for their intended purpose, no warranty is given by Conwy County Borough Council in this regard. Users are required to validate any information provided independently and any reliance upon the information is at the user's own risk. Neither Conwy County Borough Council, nor HR Wallingford Ltd., accept any liability for loss or damage suffered by the user or any third parties through the use of the information. More information about the Flood Maps is given on the Supporting Information page. Please note, these maps have been produced courtesy of Ordnance Survey according to their OpenSpace licence agreement. In particular, you may print up to ten paper copies of a screenshot, no greater than A4 size (625cm squared). Conwy County Borough Council, Bodlondeb, Conwy, North Wales, LL32 8DU.